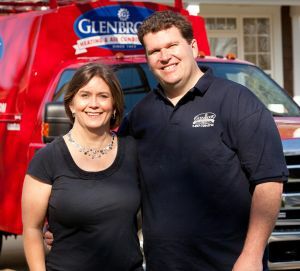 Glenbrook Heating & Air Conditioning has been serving the North Shore area since 1969. For almost 50 years, the Yurk family has been helping families enjoy total comfort in their homes. Our reputation is very important to us. We have built our reputation through years of experience and by putting our customer’s first. A large part of our business consists of repeat and satisfied customers. As a result, a majority of our new customers have been recommended to us by our satisfied customers. We have been rated by Checkbook magazine and Angie’s List as one of the top HVAC companies in Northern Illinois. Glenbrook Heating & Air Conditioning then and now. In 1969, Fred Yurk began Glenbrook Heating & Air Conditioning in a small garage on the Glenview Naval Air Station. In 2004, Fred’s son Brad purchased the business with his wife Jill and incorporated the business. The Yurk family continues to own and operate Glenbrook Heating & Air Conditioning with the same pride and dedication to customer service and integrity that began in 1969. Although the heating and air conditioning industry has changed quite a bit over the last 50 years, we have maintained the quality that our customers have come to expect over the years. We are proud to be a certified American Standard Customer Care Dealer. This distinction is not easy to come by and indicates that Glenbrook Heating & Air Conditioning has undergone special training and adheres to high customer service standards. When it’s time to purchase a heating and air conditioning system for your home, put your comfort in the hands of the Glenbrook family. If you need service now, give us a call at 847-729-0114 Our high quality customer care team is here to make sure that your home gets right back to a comfortable temperature. We want you to be just as delighted by our services as our existing happy customers! All dealers are not created equal. Which is why you must be thorough when selecting one. Just look for the Customer Care Dealer Badge. It will indicate an American Standard dealer of the highest standing – a dealer that is committed to excellence in every aspect of their business, from installation and service to customer care and employee training. The Customer Care Dealer designation is not easy to come by. Dealers qualify for this honor on a yearly basis by meeting American Standard’s stringent standards for professionalism and technological expertise. When it’s time to purchase a heating and air conditioning system, put your comfort in the hands of a Customer Care Dealer. Glenbrook Heating and Air Conditioning is recognized as one of the top heating and air conditioning companies on the NorthShore in Checkbook Magazine.